HUA HIN, Thailand (16 November 2010) – Thailand further bolstered its reputation as the epicenter of Asian golf with the early November visit of Tiger Woods, the award of The Royal Trophy to Black Mountain Golf Club, and a haul of hardware from the region’s annual golf industry conclave. The fifth edition of the biannual Royal Trophy, the Ryder Cup style competition pitting top touring pros from the continents of Europe and Asia, has been scheduled to take place 7-9 January 2011 at Black Mountain GC, a member of ‘Golf in a Kingdom – The Thai Golf Experience‘ (www.golfinakingdom.com), the country’s leading consortium of resort courses and hotels. The same week in early November, Tiger Woods joined Paul Casey, Camilo Villegas and Jaidee in a super high-profile Skins Game at the private Amata Springs Golf Club in Bangkok. It was Woods’ first trip to the homeland of his mother, Kultida, in 10 years. The event was part of celebrations marking King Bhumibol’s 60th year on the Thai throne. Woods, accompanied by Jaidee, tried to make up for it by handing PM Abhisit a check for 2.2 million baht (some US$75,000) from Skins Game ticket sales – a donation to victims of recent floods. 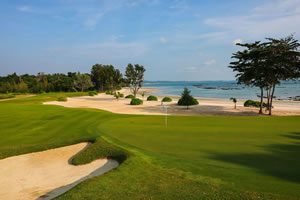 Thailand has long been the preferred golf tourism venue in Asia – where golfers from across Asia-Pacific play on holiday. But as the overall focus of golf worldwide – its tournaments, its world-class talent pool, its course development – continues to shift East, Thailand has assumed an ever-larger role, especially in the tournament realm. Black Mountain GC in coastal Hua Hin will host the Asian Tour’s Black Mountain Masters 16-19 December, while another Golf in a Kingdom member, Siam Country Club in Pattaya, entertains the world’s top women golfers at the LPGA’s season-opening Honda PTT LPGA Thailand in January, as it has the last three years. “The tournament scene in Thailand is booming, and this growth extends fun, competitive opportunities to golf holiday-makers and members of the Bangkok corporate world alike,” said Mike Varney, general manager at Golf in a Kingdom member course Muang Kaew GC in Bangkok. Varney cited as an example the first-ever Corporate Masters played at Muang Kaew on 4 November. The event attracted more than 130 golfers in corporate teams of two, all of them playing for prizes and a chance to represent Thailand at Corporate Masters World Final at Yas Links in Abu Dhabi in December. 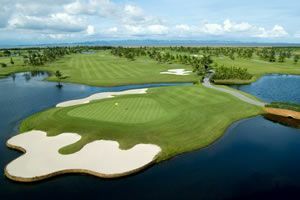 “The sponsors for this one event – Etihad Airways, Intercontinental Hotels, Professional Sports group, the Tourism Authority of Thailand, Bangkok Airways and The Nation Group publishers – illustrate pretty well that corporate entities in Thailand see the growing value and popularity of golf here,” Varney said. 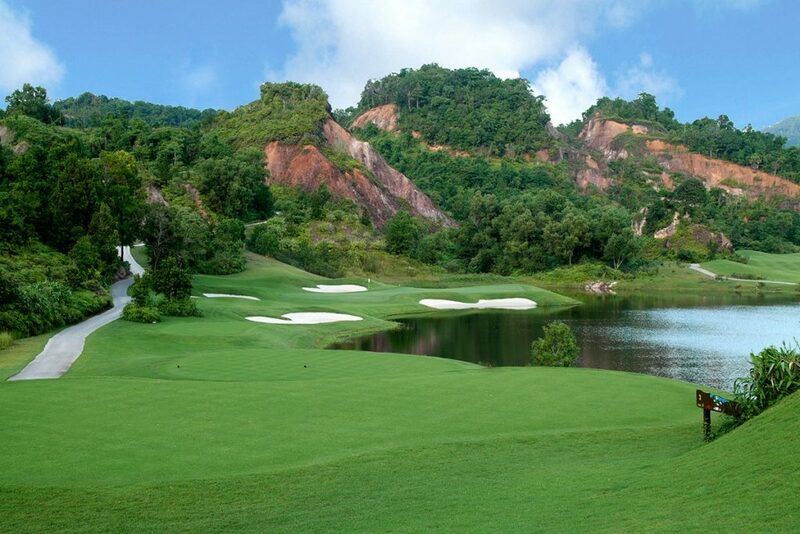 While Golfasian books holiday tours across Southeast Asia, Siegel emphasized that Thailand remains the foremost golf destination in Asia because of its roster of more than 250 golf courses, all but a handful of them resort courses open to public play. Golf in a Kingdom: The Thai Golf Experience gathers the best of them together and pairs them with accommodations from Marriott, Hilton and Anantara. Thai Country Club was runner-up to Royal Melbourne GC as “Best Course in Asia-Pacific”. Black Mountain earned “Best Pro Shop in Asia-Pacific” and placed third in “Best Championship Course in Asia-Pacific”. Banyan was runner up for “Best Clubhouse in Asia-Pacific”. And Thailand was once again named, “Best Golf Destination in Asia-Pacific“, ahead of Australia and China.